When you’re about to fall when riding your bike, you steer into the direction of the fall without even realising it. This correction can be explained using the principles of physics; your supports, i.e. the wheels, remain in balance due to the centre of gravity. 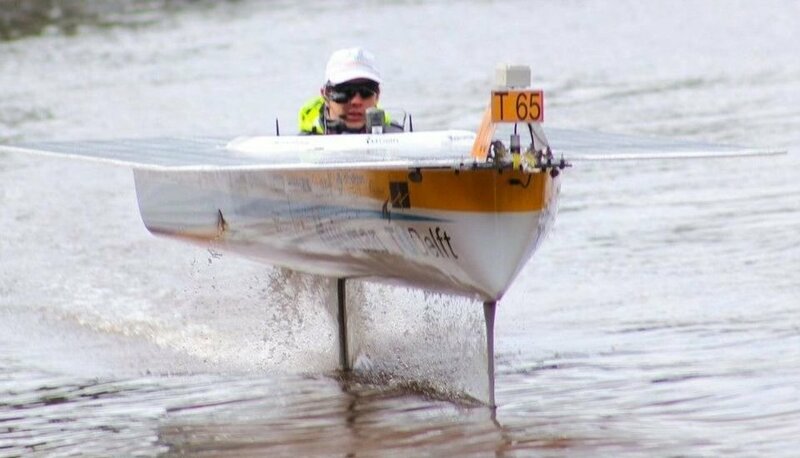 Now, for the very first time, it has also been scientifically proven that this principle of bicycle stability can also be used to maintain the stability of a hydrofoil, such as the TU Delft Solar Boat. The students recently published their findings in the Naval Engineers Journal, an academic journal published by the American Society of Naval Engineers. Foils (or struts) are small wings under a boat, which, provided the boat is travelling at a sufficient speed, can raise the hull out of the water in the same way as an aircraft’s wings lift the hull of an aircraft into the air.Scientists and researchers have been struggling with the challenge of improving the stability of ‘flying boats’ for many years. Students Gijsbert van Marrewijk and Johan Schonebaum have been gripped by this phenomenon ever since they were members of the TU Delft Solar Boat Team in 2013.”We used a mathematical model to validate whether a single-track hydrofoil using two foils one behind the other in the water would remain stable in the same way as we stay upright on a bike,” says Marrewijk.Experimenting with the 2016 TU Delft Solar Boat, designed and built by TU Delft students under the supervision of bicycle researcher Arend Schwab, they showed that the hydrofoil can indeed be kept upright during flight using the principle of steering into the fall. During these experiments, the pilot steered into the direction of the fall and the students recorded things such as speed, altitude and roll angle.”Because steering and keeping a hydrofoil upright is much more difficult than riding a bike, the pilot received intensive training from the students on the Solar Boat team,” explains Schonebaum.But a boat is not a bike; instead of revolving wheels it has small foils under the surface of the water.Not to mention the fact that weight is distributed and carried differently.”It is extremely difficult for a hydrofoil pilot to simply take to the water straight away, which is why we developed a computer simulator to enable the pilot to practice beforehand.”The validated mathematical model was built into this training tool.From now on, the teams will be able to use this model to calculate the stability of new solar boat designs in advance.”Before we developed this model, we would only find out that the boat wasn’t stable enough once we got it onto the water. This simulator will probably save future Solar Boat teams a lot of unnecessary hours of building and frustration,” says Schonebaum.The research has already been put to use in the design of this year’s solar boat.The team has expanded the steering system based on these research results, which means that the boat can now turn at a higher speed and with a smaller turning circle.